Dr. Meghna Thacker / Energy / How does your Gut Feel? I am not asking about your Gut feeling! No, seriously, do you suffer from gas, bloating or indigestion? Or, after you eat, does the food just sit in your stomach and feel like a burden? Or maybe you pop tums after each meal to get rid of the heart burn. Sometimes, your body gives these physical symptoms that you are having trouble with digestion but a lot of times you Doesn’t! I recently saw a female patient, looks extremely healthy and feels great. She has good energy, exercises regularly and makes good food choices. She has a very positive outlook to life and is usually happy and smiling. Anyways, she had labs done and she was positive for Hashimoto’s Thyroiditis. Her thyroid antibodies are off the roof. She was shocked since she does not have a single symptom related to that diagnosis. I was surprised myself, since patients who get diagnosed with Hashimoto’s usually complain of many symptoms, some of which are fatigue, hair loss, weight gain & depressed moods. I explained to her that this was an autoimmune condition where her thyroid antibodies are attacking her thyroid gland and causing inflammation. If this inflammation goes untreated, it can eventually chew up the thyroid gland. She was determined to find out what was causing this to happen. I told her that there can be many reasons. We can pin point the root cause by running some functional medicine testing. She was onboard with that. 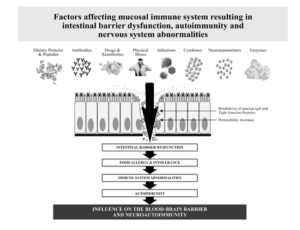 Before you read further, I want to share that 80% of our immunity lies in the Gut. Yes! Thus, if our gut lining is damaged due to inflammation, that can give rise to autoimmune conditions. This means, conditions where our body’s own immunity is attacking our tissues due to molecular mimicry. Have a look at this picture to understand how that happens. Actually, I did not order them at the same-time but it really helps to look at all of the results together to find out the correlation between them. The micronutrient test revealed multiple nutrient deficiencies. She wondered how she had so many deficiencies when she always made good food choices. Thus, I suggested the GI Map stool test to find out how her gut microbiome was. Maybe she is not digesting and absorbing the foods that she is eating? And yes, that was the case. Her test revealed severe inflammation in her gut and positive for leaky gut. She also reacted positive for antigliadin antibodies, means she is gluten sensitive. It all started to make sense. Then she shared that when she avoids dairy from her diet, she feels better. Thus, I thought that she has to be sensitive to more than a few foods which is causing this severe inflammation in her gut. Guess what? Her food sensitivity test revealed 35 sensitivities! The point of sharing this example with you is that sometimes we can prevent certain chronic or autoimmune diseases to happen by looking into our Gut. I mean, by ordering some functional medicine testing which can help pin point the root cause of the problem. Would it not be nice if we prevent a disease from exacerbating? Maybe we saved her thousands of dollars from being on immunosuppressive medications for the rest of her life that are used to treat autoimmune conditions like rheumatoid arthritis. Or Maybe Not. Maybe, I was asking about your Gut Feeling! Trust Your Gut.